Coin-op Medal Game published 11 years ago by Konami Digital Ent. 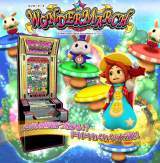 Wondermarch © 2008 Konami Digital Entertainment Company, Limited. - "Meteor Spark [Tower Pusher Series]"
- "Wondermarch [Tower Pusher Series]"